Do you know which Hogwarts house you’re in? I probably am a Gryffinclaw, but I was sorted into Ravenclaw at Pottermore, which is by the way a b r i l l i a n t website. It is amazing to discover how much thoughts J.K. Rowling had given to the world of Harry Potter. Did you know she had begun establishing rules for her characters and the universe 5 years before she actually started writing? All the more reason to throw a Harry Potter Party and pay her some tribute. 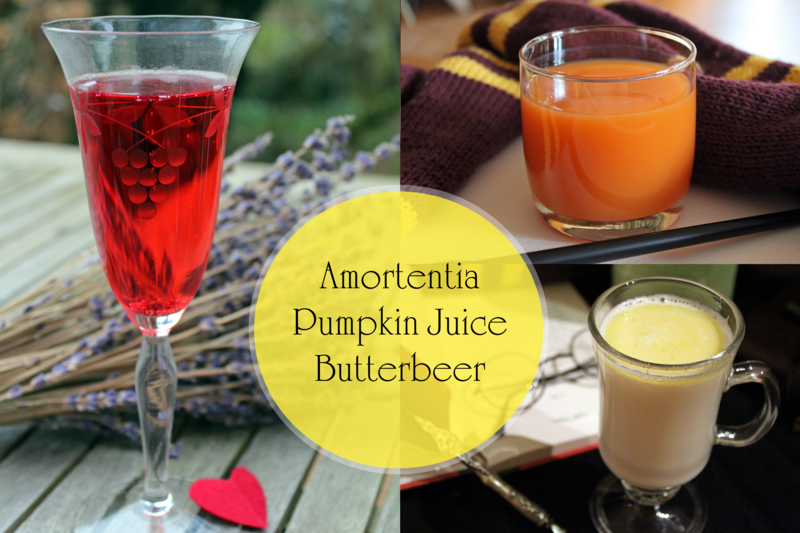 For refreshments, I served Amortentia Potion (basically a red fruit flavoured punch), Pumpkin Juice and hot Butterbeer. I stumbled across so many different versions of Butterbeer, but in the end I made my own version of it, though I haven’t stopped trying. Ah, the love potion. I wonder what it would smell like for me. Maybe like Chocolate Chip Cookies straight from the oven, a bracing spring morning and freshly ground coffee. 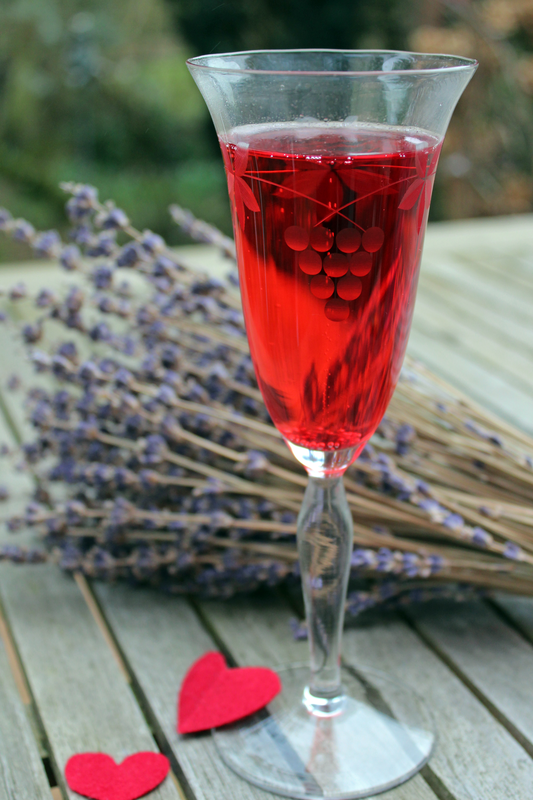 But the Amortentia I’ve made smells like raspberries, pomegranate, sparkling wine and elderflower. I combined white and sparkling wine, added some elderflower syrup and grenadine to sweeten and some red fruits for taste and colour. You can use raspberries, pomegranates, strawberries, red currants or cherries for red colour, or if you want it to be rather violetish use blueberries and blackberries. You can really become a potions master here and just put everything into the cauldron that matches with your imagination of the Amortentia. But beware of who you’re giving this potion to. You might end up with more admirer at the end of the party than you’d wished for! Don’t panic, if the pumpkin season is already over. The truth is, I didn’t use much pumpkin in this recipe. Instead I used carrot juice, pineapple juice, apple juice and lime juice and just a few spoons of pumpkin puree. Anyway, you should serve the pumpkin juice ice cold. I filled it into water bottles and stored it in the cold outside. 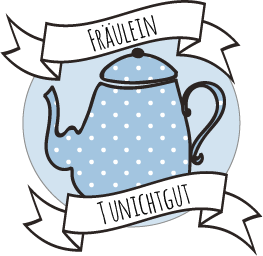 It was very refreshing and very much as I had imagined. I definetely understand why Harry longs so often for ice cold pumpkin juice in the summer. 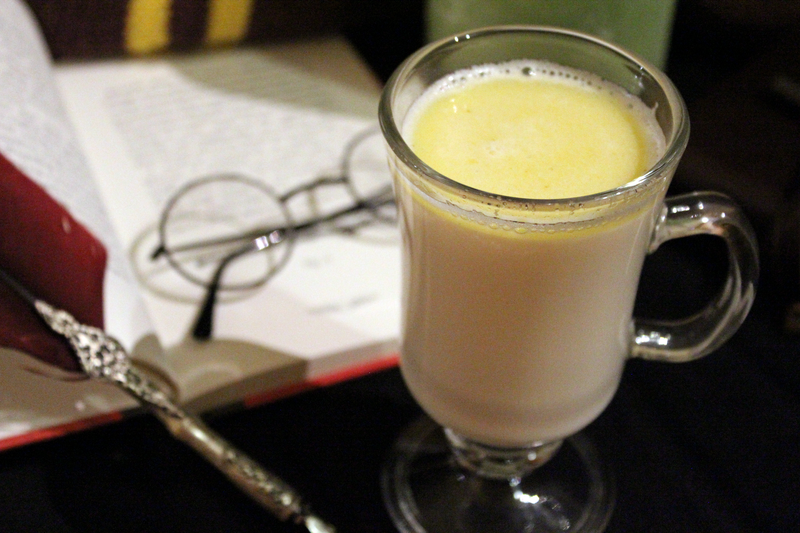 Toss your books and quills aside, make a trip to Hogsmeade and enjoy a steaming cup of Butterbeer. In most recipes, people use cream soda to recreate the delicious flavour from the Butterbeer that is served in the Wizarding World of Harry Potter in Orlando. But since cream soda is not available, I tried something else. As J.K. Rowling described Butterbeer „to taste a little bit like less sickly butterscotch.“, I made a butterscotch syrup. 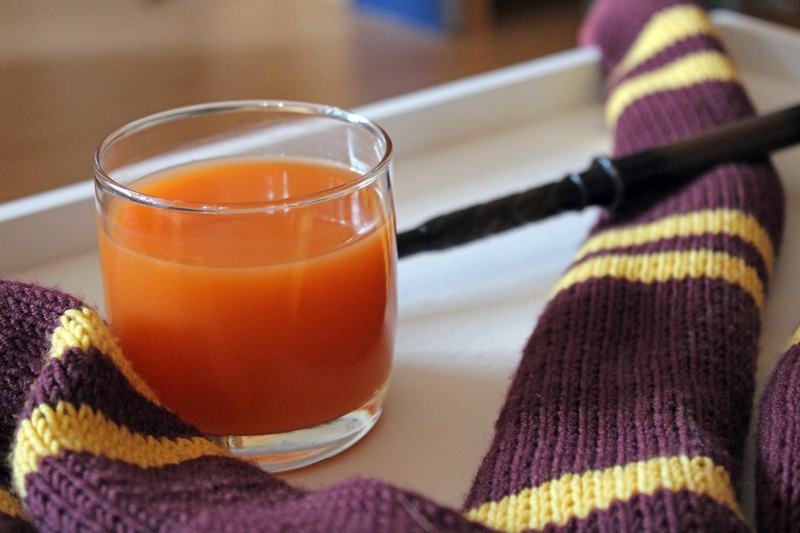 Blend some butterscotch into milk, add rum and you have your perfect cup of Butterbeer. I found another version with cider, ginger ale and whiskey and butterscotch syrup, which is not as heavy as the milk version but completely different. If you want even more inspiration head out to Buzzfeed or Pinterest and be amazed at people’s love for Harry Potter.